From its humble beginnings, OOTC has evolved into a city-wide coalition of religious and charitable organizations (over 50 in the GTA) participating in a program run entirely by groups of dedicated volunteers. Each site operates independently, providing food, shelter and clothing to those in need, and in a manner which respects their dignity and self-worth. The OOTC Ministry that operates out of St. Matthew’s Anglican Church Gymnasium for 20 weeks during winter months is a partnership between St. Matthew’s and our neighboring church, Our Lady of Peace Catholic Church. The first winter season of full operation was November 1999 to March 2000 (20 weeks). 0n Sunday evenings through Monday mornings, St. Matthew’s Anglican Church, together with Our Lady of Peace Catholic Church, offer a warm and safe environment and friendly human contact for our Guests that for many is even more important than overnight shelter and food. Thousands of people live in the City of Toronto without permanent shelter. The Guests of the Out of the Cold program are some of these people who are homeless and who have been living on the city streets. During the winter months, a number of churches provide a warm, safe place to sleep on different nights of the week. For many people who are homeless, these churches provide a welcome refuge. Before coming to our shelter, the Guests may or may not have already tried to find shelter in one of the permanent facilities in the city. In many cases, the Guests have had such bad experiences in these shelters (such as assault, theft or rude treatment) that they prefer to “take their chances” on the streets where they feel safer. The attraction of the Out of the Cold program for many of the Guests seems to be its non-judgmental atmosphere because of the sharing that takes place between the volunteers and Guests. Our Guests are primarily male and the ages range from the twenties to over sixty. On an average night we feed up to 50 Guests and among those Guests 30 men stay overnight. We do not have facilities for women to stay overnight, but they are welcome to come for dinner. For the safety of other visitors, the volunteers and the other users of the premises, Guests of the Out of the Cold program are required to respect all city of Toronto By-Laws which include, but are not limited to, smoking, alcohol and drugs. There is an understanding at all Out of the Cold programs that any Guest who is found with a weapon on them, or who confronts another Guest or visitor with violent behavior will be asked to leave, and in most cases they will be informed not to return. We open our doors to Guests each Sunday at 5:00 p.m. from November to the end of March and provide them with a hot meal, as well as a breakfast on Monday morning for those that stay overnight. Overnight Guests have an opportunity to shower and have the clothes they are wearing laundered. A TTC token when they leave (for overnight Guests). Our Out of the Cold program is fortunate to have a roster of very dedicated volunteers, some of whom have been with us since the beginning of our program. We could not continue this program without their support. Contact us for our Volunteer schedule of opportunities - we would love you to join us! We could not operate without our dedicated volunteers who give of their time and talent to this ministry. We are entirely volunteer run and volunteer dependent. We receive NO funds from any government at any level. Our money comes from donations. We are indebted to several corporations, businesses, churches and individuals for their on-going financial support. 100% of all financial gifts made to Out of the Cold through St. Matthew’s Church are used by Out of the Cold and qualify as charitable contributions for tax purposes. Our largest financial expenses are for food and new clothing. This does NOT include the food for the evening meals provided by the various churches and organizations mentioned above which they provide and pay for themselves – and for which we are VERY thankful. We are also grateful for donations made throughout the season of MEN’S warm winter clothing and footwear. For more information, you may contact one of the Out of the Cold coordinators listed below by calling the church office number provided. The Food Cupboard ministry has been in place at St. Matthew’s for well over 50 years – all parishioners of St. Matthew’s, young and old, whatever their circumstances, give donations of food for people who come to our doors seeking help. We also receive gifts from organizations and groups who use our church facilities. Each week volunteers collect the food from a central container, bag it and leave it ready for church staff to distribute. When there is a surplus of food, we take it to the Food Bank in our area or other organizations as needed. The Food Cupboard is open each Wednesday from 10 am to Noon. Contact the church office to access this service or for more information. 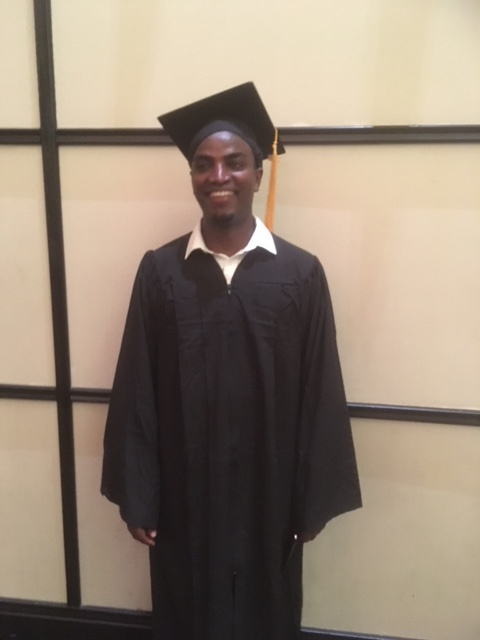 Ridwan has successfully completed eight months of classroom studies as a Physiotherapist’s Assistant at the National Academy in mid Toronto. He is now working on his placement or internship which consists of 320 hours of unpaid work in a physiotherapy clinic. Once this final step is finished, likely in mid-October, Ridwan will search for a permanent job in his field. As you can appreciate, with English not being Ridwan’s first language and the curriculum being one of very detailed medical terminology, he had to study extremely hard to complete the programme. We are very proud of his accomplishments to date. 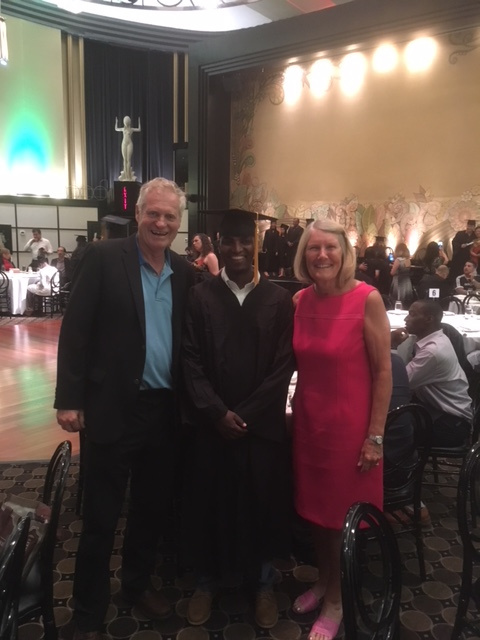 On July 18th Stuart and I accompanied Ridwan to his graduation dinner with all the other students from the National Academy. It was held at the Eglinton Grand and was a formal affair with the graduates wearing robes and mortar boards and introduced separately to come to the stage for their diplomas. Photos are attached of this important milestone in Ridwan’s life. Ridwan continues to work at Bayshore Home Health on a part time basis on weekends and will be actively seeking full time employment in the next month or so. He remains so very thankful for the opportunities and support that St. Matthew’s Church has provided to him in Toronto. By the time this article reaches you, hopefully many of you will have met Ridwan at the BBQ on St Matthews Sunday, Sept. 23rd which he plans to attend. About two years ago, our committee, M25:40, envisioned responding to the needs of a Syrian family seeking refugee status in Canada. However God brought before us the chance to help a single Ethiopian man fleeing persecution in his country. It has been an intense learning experience filled with challenges, bureaucracy and confusion but lots of laughter and love on both sides. It is our hope that our efforts will now see Ridwan “launched” and able to contribute in a meaningful way to his “adopted” country. To all who contributed in any fashion to his success, thank you.